I have started doing a lot of exploratory walking/canyoning, for these kinds of trips a map is useful… but bringing my originals has caused them to get damaged – mainly water in canyons. For this reason I have started leaving my originals at home and taking a print out of the area I will be visiting. My recent discovery of lamentation has also made this a very practical option as the maps are also waterproof, the only real downside would be that you cannot annotate… but I recently discovered that the ultra fine permanent markers are perfect for this and didn’t even smudge. So recently I decided to look into automatically downloading my area of interest. Using my prefferend browser (Firefox) allows me to right click the page and “View Page Info”. In the Media tab you can find all the tiles that have been downloaded for the current view. A quick check showed that I could copy-paste the location of the images into my address bar to in effect download that tile. After the /tile directory, the first number seems to indicate the zoom or Z value. The highest resolution tiles seems to have this at a value of 16, numbers lower than this weren’t of real interest as I was looking a more localised areas. And besides I could scale the image later if I wanted and the zoomed out tiles are near useless). the last number represents the X coordinate. I found you could download tiles using wget with the appropriate flag to ignore the invalid certificate. I put this into a shell script which would loop over the range I had set and download all the tiles. I could then use the montage command to stitch all the images together! 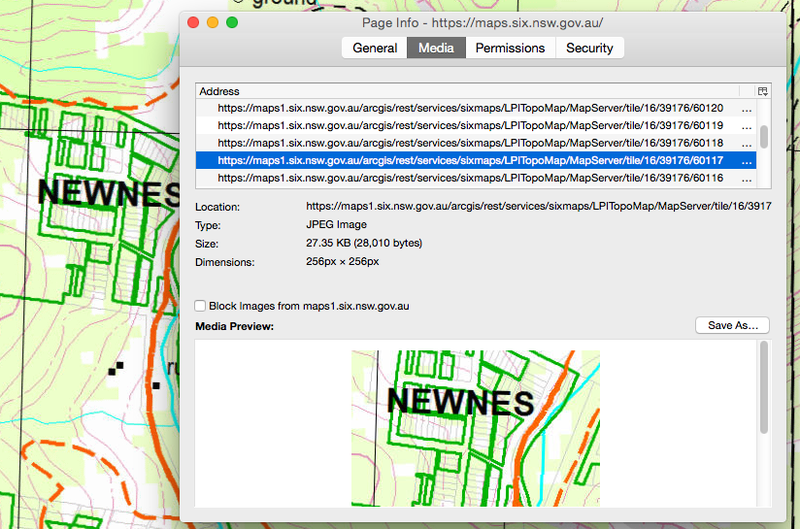 Use a similar process to get the satellite imagery - Edit: you can easily do this by changing the url! This generates vector data for a selected area allowing for heavy map customisation (much better for printing!). It can also create georeferenced .kmz files for Google Earth!